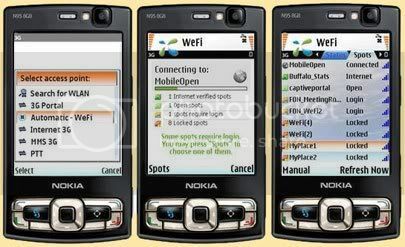 WeFi is mobile application for symbian 3rd and 5th edition. It automatically detects and qualifies all Wi-Fi access points within range and connects you to the spot with the best Internet connection. FaceStore Messaging is a fun, entertaining and easy to use solution from Anthropics which allows mobile users to send and receive fully animated video messages from just a single image and a voice recording. Shazam ID is tells you what track is playing simply open the application, press tag now, and hold phone close to speaker, it comes back with song, album and even album art information.